A group Abia Professionals Forum (APF) has warned the former Governor of Rivers State and Transportation Minister Chibuike Amaechi to stay clear of the Abia State politics If he wishes to remain in President Muhammadu Buhari’s administration. 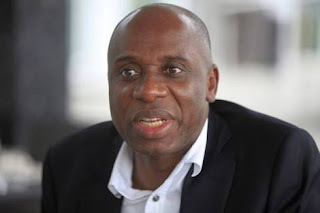 The group in a statement by its National President Comrade Ogbonnaya Igwe on Wednesday in Umuahia wondered why Amaechi should leave Rivers State and come to Abia to install Alex Otti, a desperate politician as governor. According to the group, if Mr Chibuike Amaechi refuses to adhere to the warning especially now that the Supreme Court is moving to lay to rest the True winner of Abia State governorship election, they will have no other option than to tell the whole World why Amaechi is desperately rooting for Immunity for Alex Otti. Comrade Igwe also frowned at the Conduct of the Justice Oyebisi Omoleye led five-member Appeal court panel which ordered that Alex Otti of the All Progressives Grand Alliance be Inaugurated as the Governor of Abia State after disenfranchising over 300,000 Registered voters. The group expressed Hope that the Justices of the Supreme Court will restore the mandate freely given to Governor Okezie Ikpeazu in April 11 and 25th 2015 Supplementary governorship election in Abia State.